New old stock CSU. It was installed on a bike and then removed. 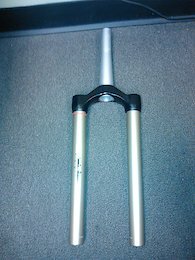 Steer tube is tapered and 6.75 inches long. There is paint rub on the side of the crown and a couple of marks from the crown race. The stanchions are mint. For 26 inch wheels and travel is 160/170mm. Shipping is $20 to the USA. 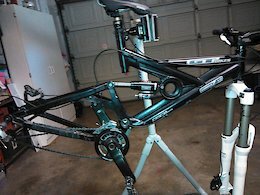 I'm looking for a size small frame any color. Scratches are ok, but cracks and busted welds not so much. Let me know what you have. Used 2010 totem with solo air. 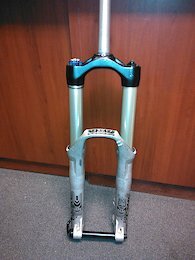 The 1 1/8 steer tube is 7.5 inches long. New lowers installed with new bushings, seals and wipers. There is a tiny ding on the left stanchion about half way up. It is not deep and you can barely feel it. All adjustments work as they should. There are marks on the crown from race removal. Fork is ready to ride. Shipping is $25 to the USA. 9.5x3. Shock has maybe 15 hours on it. The tune is M/M. All the adjustments work and there are no oil leaks. 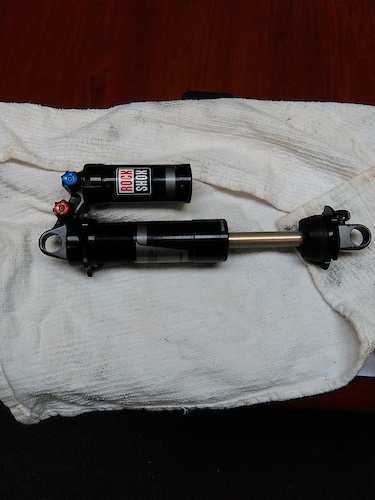 Shock comes with your choice of 400, 350, or 300 lb spring. You will need bushings and mounting hardware. Shipping is $10.00 to the USA.